The Codys should just change their last name to trouble since it always finds them—or, as is often the case, they stir it up on their own. Case in point: In "Cry Havoc," Tuesday's episode of Animal Kingdom, Smurf's (Ellen Barkin) dealings ended up inadvertently spelling big trouble for J (Finn Cole) and Nicky (Molly Gordon) at the hands of a vengeful Javi (Alex Meraz). 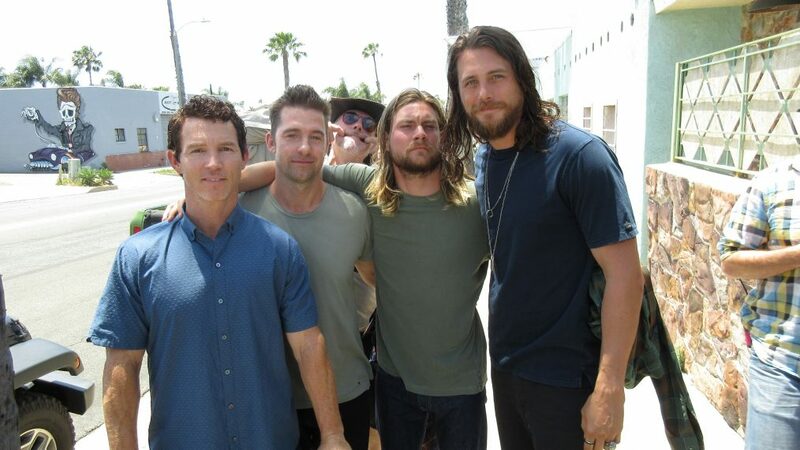 What happens next is sure to pull the entire family back on the same page, which should make for good dramatic TV, since Baz (Scott Speedman), Pope (Shawn Hatosy), Craig (Ben Robson) and Deran (Jake Weary) have all made a concentrated effort to step away from Smurf. Weary talked with us about this week's big episode, and, yes, the subject of Deran's lack of a love life so far in Season 2 was part of the conversation. (You're welcome). Let's see what he had to say about this episode and what's coming next. A few episodes back, Deran told Smurf that he’s gay. It was not your typical coming out scene, for sure, but how was that for you to shoot? Jake Weary: That was very intense for me. Especially working with Ellen, both of us really wanted to make this special and just really stick to the root of these people and be as true as possible to these people and find the humanity within the chaos. When you get material like this that is so important, you really want to be as grounded as possible, and I think that was the big challenge. For Deran, I don't even think he was planning on coming out to her in that exact moment. It was just all that pent-up frustration and anger towards her, and somewhat a little bit of self-loathing, too, in the fact that it's taken him so long to say this. That stems from his anger towards his mother, too, and the fact that she's never been there for him. Whether it's a matter of her having known the whole time, it hurt. It hurts him that maybe she's known this whole time and has never come forward to him or tried to support him or talk to him about it. In this week’s episode, Deran goes to a community meeting and is asked to leave some money, which of course he refuses to do. Safe to say that’s going to lead to some trouble? Definitely. This is all part of Deran becoming a man. It's putting his big-boy shoes on and that comes out in spurts, but there are certain things that you have to do when honing a business that he doesn't necessarily feel like he has to do, and it's going to have repercussions. It's all a learning process for him. At the end of the day, he's still a pretty stubborn guy. This bar is like his baby, so when someone's telling him how to run his own business, he's going to be brash about it. There’s a scene where the Cody boys are wanting to set up a scheme in the bar and Deran flat out tells them no. Is that going to become more and more difficult for him with his family? Definitely. We're going to reach a crossroads at a point in the season where Deran really has to figure out what he really wants. Does he want to remain in this life and still be a part of his family, or is he going to, you know, go AWOL and do his own thing? So it's this kind of balancing act—or can he do both? It's his coming-of-age story, and he's just trying to figure out what he really needs and wants. It's not easy having a bunch of older brothers bearing down on you and telling you what you need to do. I think that's the hardest part, too, is that he's not easily persuaded, but he's easily manipulated by love. At the end of the day, they're family, and these are his people, and these are his brothers that he really does love. It'll be really interesting to see where it goes. Safe to say that with all the trouble Javi has brought to the family by roughing up J that Deran will be pulled into that drama soon? Yes. Because J is involved in this, it has become a family matter, and it is an exterior threat to the family. Usually those types of things bring the family together, so Deran will get involved in trying to figure out how to deal with the situation and how to try and figure out what to do with Javi and how to protect the family. And now that J has become a member of this family, they're also trying to protect themselves, too. There can't be any loose ends. What's up with Deran's love life? We haven't seen too much this season, but are things going to start heating up? I know I feel like a lot of people on Twitter have been like, ‘This guy needs to get laid! Why hasn't he fallen in love yet? What's going on with Adrian?’ [laughs] This bar has taken up a lot of his mental capacity, but I think now that he's come out to his mother, you could say a weight has been lifted from his shoulders, and that's definitely going to come into play. You're going to see Deran finally just having fun and enjoying himself and calling the shots. And just experimenting and just having fun with who he is and his sexuality. That will come into play, so don't worry, it's coming. He can't just be a responsible property owner all the time. You'll see he definitely knows how to have a good time. What do you think you learned from shooting Season 1 that actually helped you play Deran in Season 2? Me as the actor was a little naïve in playing him in the beginning. Just because you really have to dive in and there's not a lot of material, and even the writers are discovering the character as it's going along, and you're helping them mold this character into something that kind of takes shape over time. So for me, I think going into Season 2 I had a better idea of who this person was, who this person is. So it was a little more exciting coming into it and having a little bit of source material to work with from the first season. It just makes it more exciting.